Objectives To summarize recent pediatric subspecialty workforce analyses and to highlight similarities and differences across studies. Design By using MEDLINE, we conducted a systematic search of the literature published from January 1, 1992, through December 31, 2002. We included research articles and task force reports, and abstracted author, year of publication, specialty, sample size, analytic perspective (eg, physician or academic department), inclusion of data on nonclinical activities, inclusion of an objective measure of demand, and workforce-related conclusions. Results We identified 41 relevant articles. Physician surveys provided data for most (n = 24) of these studies. Only 8 studies attempted to make future workforce projections; of these 8 studies, 1 explicitly accounted for nonclinical activities in its projections. An additional 16 studies presented data on involvement in nonclinical activities. While some studies suggest that additional pediatric subspecialists are not needed, these studies did not include objective assessments of demand in geographic areas where pediatric subspecialty physicians are not available. Of those studies that took a market perspective and attempted to account for demand, workforce recommendations varied considerably across specialties. Conclusions We know little about the distribution of the pediatric subspecialty workforce relative to the demand for their services. Given concerns about the adequacy of the pediatric subspecialty workforce, future research should assess the availability of these physicians relative to need for their services and account for nonclinical activities in workforce projections. In its 1981 report, the Graduate Medical Education National Advisory Committee estimated workforce requirements for 6 pediatric subspecialties, projecting shortages in all by 1990.1 Since then, numerous studies have investigated the adequacy, composition, and geographic distribution of the physician workforce2-9; yet, to our knowledge, none has examined pediatric subspecialties separately. Despite long-standing contentious debates about physician supply, there has been no national effort to examine the adequacy and distribution of the pediatric subspecialty workforce. The pediatric subspecialty workforce may become an important policy issue in coming years. Improved survival rates among very premature infants and children with previously fatal childhood illnesses, such as cystic fibrosis, may lead to increased need for pediatric subspecialists. In addition, increasing incidence rates of asthma and diseases related to childhood obesity during the past decade10-12 may also increase the need for pediatric subspecialty care. Despite the potential for these factors to increase need, most pediatric conditions have low prevalence rates, requiring large population bases to ensure sufficient demand to sustain subspecialty practice. The literature linking pediatric subspecialist supply to children’s health care use is sparse. The few studies that have examined pediatric subspecialty care use among children without chronic conditions have found that children in the United States are 2 to 3 times more likely to receive a referral to a specialist,16 and that 2.3% of all pediatric office visits result in a specialty referral, most commonly for diagnosis or treatment.17 These studies did not examine the relationship between supply of subspecialists and use within the United States. Among chronically ill children, an analysis of Medicaid data found low rates of pediatric subspecialty care overall and particularly among rural residents.18 Disease-specific studies have found a relationship between rural residence and a lower probability of seeing a specialist for asthma,19 internist-subspecialist involvement in the care of children with cancer and rheumatic diseases,20-23 and delays in referral for congenital heart disease.24 Likewise, an analysis of the National Survey of Children With Special Health Care Needs found that low levels of pediatric subspecialist supply were associated with an increased likelihood of having an unmet need for specialty care.25 These studies suggest that the availability of pediatric subspecialists has important implications for the use of their services. As the first step in evaluating the adequacy of the supply of pediatric subspecialists, we have performed a systematic review of the recent literature on the pediatric subspecialty workforce to summarize analyses and highlight similarities and differences across studies. For this review, we include the subspecialties of pediatrics and disciplines that allow pediatric training in fields otherwise not exclusively pediatric, such as otolaryngology and psychiatry. We excluded articles on care provided by nonphysicians. Articles that focused exclusively on primary care issues, such as acute illness, immunizations, reproductive health, and prenatal care, were also omitted. We excluded editorials, comments, letters, review articles and meta-analyses, practice guidelines, and policy statements. Our review took place in 2 stages. First, abstracts were reviewed by at least 2 (A.C.S. and M.L.M.) of 3 reviewers; those falling into 1 of the 3 topic areas previously described and not meeting any of the exclusion criteria were retained. All abstracts considered potentially relevant by at least one reviewer were retained for full article review. Two reviewers abstracted each article independently; those meeting the exclusion criteria were omitted. Articles for which there were disagreements about inclusion or exclusion were discussed to reach consensus between the 2 of us (M.L.M. and A.C.S.). We reviewed articles that addressed the size, distribution, and/or adequacy of the pediatric subspecialty workforce. We used a broad definition of pediatric subspecialties, including specialties certified by the American Board of Pediatrics or other boards and those not recognized by the American Board of Medical Specialties. All included specialties had to have a pediatric focus (ie, internal medicine subspecialties were not included). We abstracted information on the subspecialty, data source, and presence of workforce projections. For analytic perspective, we determined whether each article analyzed the workforce from the perspective of physicians, academic departments, hospitals, or market areas. We classified articles by whether they presented data on nonclinical activities and the demand measure used (eg, advertised or projected positions, physician-population ratios, disease incidence, and/or population growth). Finally, we extracted and summarized workforce recommendations. Because of the heterogeneity of studies and specialties, we deemed meta-analyses inappropriate. Our initial search strategy identified 1618 abstracts. We retained 432 abstracts for full article review; 108 of these articles were related to the size and/or distribution of the pediatric subspecialty workforce. Of these articles, 41 met our criteria for inclusion in the final review. 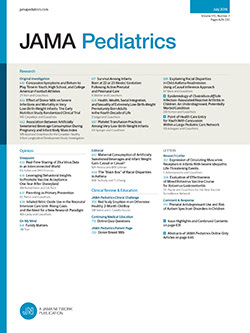 The 67 excluded articles were omitted for the following reasons: 33 (49%) did not include new data and/or analyses, 8 (12%) focused on general pediatrics, 11 (16%) were not relevant to the topic, and 15 (22%) were excluded for other reasons, including studies of adult patients or nonphysician providers (nurses, physician assistants, social workers, and any other allied health professionals) and those outside the United States (percentages do not total 100 because of rounding). This section has 2 parts. First, we describe included articles in terms of their abstracted characteristics. Second, we summarize relevant workforce findings by specialty. Of the 41 included articles, 6 studied multiple pediatric subspecialties simultaneously (ie, multispecialty studies); 35 were specialty specific (Table). While some subspecialties, like pediatric surgery and neonatal medicine, were the subject of multiple workforce-related studies, most had one relevant study during the time period. Several specialties, such as allergy-immunology, pediatric hematology-oncology, and pediatric orthopedic surgery, had no specialty-specific workforce studies during this period. More than 40% of the included articles used data from individual physician surveys. Approximately one quarter of the included articles were task force reports and/or used data from the American Medical Association’s Physician Masterfile or other physician data sources. More than half of the studies lacked any data on nonclinical activities. Among the 6 multispecialty studies, none made workforce projections. Five approached the workforce from an individual physician perspective; one approached the issue from the perspective of children’s hospitals. One article considered demand in terms of the number of open positions; another article viewed demand from the perspective of the hiring intentions of hospitals. Among the 35 subspecialty-specific studies, less than one quarter (n = 8) made workforce projections. The perspective of the analysis and efforts to account for demand varied widely across studies. Many studies, such as those done through FOPE II, did not include any objective measures of demand. Slightly less than half of the studies took a market area perspective and accounted for demand or need using primarily indexes of advertised and projected positions and/or subspecialty-specific physician-population ratios. A detailed tabular summary of the reviewed articles is available at the Cecil G. Sheps Center for Health Services Research Web site (http://www.shepscenter.unc.edu/research_programs/child_health/mayer_appendix.pdf). Pediatric Medical Specialties.Developmental and Behavioral Pediatrics. The FOPE II study of physicians involved in developmental and behavioral pediatrics found that while two thirds reported competition for their services, more than 60% believed that their communities would need more developmental specialists in 3 to 5 years.31 On average, fellowship-trained developmental specialists spent one quarter or less of their professional time in general pediatrics. The average time until a developmental physician could see a new patient ranged from 24 days among non–fellowship- and general pediatrics–trained physicians to 34 days among those who did a developmental-behavioral fellowship. However, survey data suggest growth in neonatology practices. A 1995-1996 survey of neonatal medicine practices found that half of responding practices expected to recruit 279 neonatologists and 575 neonatal nurse practitioners in the 2 to 3 years following the survey.35 More than 60% of responding neonatology practices were routinely involved in healthy newborn care. Pediatric Emergency Medicine. More than 50% of pediatric emergency medicine physicians surveyed for FOPE II reported a need for more pediatric emergency medicine physicians.41 In a separate survey of pediatric emergency medicine departments, department directors in 46% of programs believed that the workload was excessive for attending physicians.42 At the time of the survey, 81% of these departments reported having open positions. Pediatric Endocrinology. By using Physician Masterfile data, a study of the endocrinology workforce found that the pediatric endocrinologist to population ratio varied widely among the 20 largest standard metropolitan statistical areas, from 0.13 in Oakland, Calif, to 1.19 in Nassau-Suffolk Counties, New York.43 By using Kaiser Permanente data as a benchmark, this report concluded that there was slight excess demand for pediatric endocrinologists. By using a base case model that assumed maintenance of pediatric endocrinology fellowships, stable retirement rates, and demand increases due to population growth only, the workforce model predicted that the number of pediatric endocrinologists would be consistent with demand by 2010. Pediatric Gastroenterology. Based on a survey of pediatric gastroenterologists in North America, Colletti and colleagues44 estimate that the ratio of children–pediatric gastroenterologists ranges widely in the United States, from 80 000:1 in the northeast region to 145 000:1 in the West. Approximately 40 first-time trainees enter the job market annually; 4 leave through retirement. The survey also found that 60% of pediatric gastroenterologists described supply as “about right” and 30% said there were too many. The authors recommended reductions in the number of trainees and increases in the use of midlevel physicians to compensate for shrinking fellowship programs. Pediatric Genetics. A FOPE II survey of geneticists found that one third reported an increase in the volume of referrals while half reported the volume of referrals as stable.45 Half of respondents reported experiencing competition, primarily from other pediatric subspecialists. On average, geneticists devoted more than half of their professional time to patient care; however, more than one third devoted half of their time to research. Pediatric Infectious Diseases. A 1995 survey of pediatric infectious disease programs found that one third of the 206 fellows in pediatric infectious disease programs were international medical graduates.46 At the time of the survey, medical schools planned to add 87 additional pediatric infectious disease positions in the following 3 years, resulting in more trainees than open academic positions. This report concluded that care should be taken in the number of pediatric infectious disease fellows trained. Pediatric Pulmonology. While 60% of pediatric pulmonologists responding to the FOPE II survey practiced in a medical school setting, the percentage of pediatric pulmonologists in private practice has more than doubled since 1985.50 Nearly 70% of survey respondents indicated that there was no need for an additional pediatric pulmonologist in their community within 3 to 5 years. Pediatric Surgical Specialties.Pediatric Cardiac Surgery. A survey of 2515 adult and pediatric cardiac surgeons and general thoracic surgeons found that caseload was described as too little by 23% of pediatric cardiac surgeons vs 20% and 29% of adult cardiac and general thoracic surgeons, respectively.53 Case volume was comparable between pediatric and adult cardiac surgeons. Of responding adult cardiac surgeons, 8% also treated children. Pediatric Neurosurgery. Based on an analysis of advertised positions, the average number of pediatric neurosurgery positions increased from 3.7 per year in the 1980s to 8.3 per year in the mid 1990s.54 This trend was noted for academic and private practice pediatric neurosurgery. The authors concluded that the demand for pediatric neurosurgeons seems to be increasing. Pediatric Plastic Surgery. A FOPE II survey of plastic surgeons involved in pediatric care found that almost 70% reported competition for pediatric services in their area.63 Pediatric plastic surgeons treated significantly more pediatric craniofacial deformities and significantly fewer pediatric traumas than adult-focused plastic surgeons. The study concluded that the number of pediatric plastic surgeons will exceed demand at current training levels. Child and Adolescent Psychiatry. By using data from the Bureau of Health Professions Area Resource File and the Current Population Survey, Thomas and Holzer estimated that the state-level ratio of child and adolescent psychiatrists per 100 000 children varied from 0.81 in Mississippi to 18.9 in Massachusetts.65 In regression models, nonmetropolitan counties and counties with more poor children had significantly lower psychiatrist-youth ratios. The authors conclude that the shortage of child psychiatrists is worsened by the maldistribution of these physicians. Pediatric Radiology. A survey of pediatric radiologists found that nearly 75% reported an increase in volume.67 The number of pediatric radiologists in community or other settings grew from 7% in 1980 to 24% in 1998. In addition to the survey, the authors constructed a help wanted index and found that the number of pediatric radiology position advertisements quadrupled in 1999. Given their findings, the authors conclude that demand for pediatric radiologists exceeds supply. Attempting to rationalize physician supply is an arduous task because of the variations in workforce models and the constant evolution of the health care marketplace. Despite these challenges, it is important to understand how the current and future supply of physicians meets workforce requirements. The most remarkable conclusion drawn from this review is that we know little about the size, distribution, and adequacy of the pediatric subspecialty workforce with regard to their major professional activities. Few studies have attempted to estimate demand, account for nonclinical activities, identify relatively underserved areas, and/or project future supply of pediatric subspecialists. Before meaningful discussions about the future of the pediatric subspecialty workforce can occur, we need a better understanding of how the current workforce meets the needs of children. This review also demonstrates that discussions of the pediatric subspecialty workforce must consider the unique features of each subspecialty rather than apply a blanket solution to the entire group. During the past decade, selected pediatric medical specialties have raised concerns about the surplus of physicians while others have predicted shortages. Within the pediatric surgical subspecialties, however, there has been a more consistent call for restraint in the number of trainees. Many of these studies were done in the mid 1990s when managed care and gatekeeping mechanisms figured prominently in the marketplace. It is unclear if the recent movement away from gatekeeping will modify perceptions of workforce requirements. Measures of supply of and demand for pediatric subspecialists varied considerably across the included studies, and ranged from subjective physician assessments of competition to detailed efforts to estimate patient demand relative to physician supply. Subjective assessments are useful in informing supply discussions for the geographic areas that have physicians; however, they do not allow any judgments about those regions that lack physicians. Help-wanted indexes and similar measures of available positions are more objective, but inherently assume that the availability of a position is a market signal of demand. Because physicians can induce demand for their services, an open position may not indicate a societal need for their services; nevertheless, these measures provide an objective measure of the ability of the market to absorb additional physicians. Few specialties have used national physician data sources, such as the Physician Masterfile or society membership files, to depict physician location using cartography and/or make projections of physician supply relative to the pediatric population. Efforts to perform such analyses with reliable data sources may be helpful in identifying relatively underserved areas. To our knowledge, only one study reported wait times for initial or follow-up appointments and none reported the distances patients travel to obtain care, making it difficult to gauge whether there is excess demand or supply. Future studies of the pediatric subspecialty workforce should incorporate measures of wait times and distance traveled to allow more objective assessments. Few studies of the pediatric workforce attempt to incorporate the role of pediatric subspecialists in research, teaching, and administration into their workforce projections and/or recommendations. Given the prominent role of nonclinical activities in the professional lives of pediatric subspecialists and the importance of research in continuing the advancements of pediatric medical science, this oversight is disconcerting. Concerns about the dearth of pediatric investigators prompted a federal loan repayment program targeted specifically to physician scientists and those with doctoral degrees involved in pediatric research issues. In addition, the Pediatric Scientist Development Program, funded by the National Institute of Child Health and Human Development, was founded to encourage pediatricians to pursue academic research careers. Workforce analyses should attempt to consider nonclinical activities in their workforce projections and recommendations. A few pediatric subspecialists, especially those in private practice, are involved in primary care on a full- or part-time basis.27,29 However, 35% of those practicing in a subspecialty had no training in it.29 This raises concerns that general pediatricians may be meeting demand for specialty care in at least some locales, suggesting pockets of excess demand for subspecialty services. A recent article suggested that a surplus of general pediatricians exists, and predicted an exacerbation of this surplus during the next 2 decades.68 If such a surplus actually exists, general pediatricians may compensate for a decreasing share of demand for primary care services by providing additional specialized care. While we have provided a thorough overview of the recent literature on the pediatric subspecialty workforce, our review does not account for all physicians active in the specialty care of children with chronic illnesses and those with acute conditions, such as surgical physicians without formal advanced training in pediatrics, internist subspecialists, primary care physicians, and nonphysician providers. These various providers certainly contribute to the availability of specialized care; however, the relative quality of specialized care across these various providers is not well established. In conclusion, while the literature contains workforce-related studies for many pediatric subspecialties, few of these specialties have depicted practice location and attempted to project future supply and/or estimate demand. As such, we have a limited understanding of the adequacy of the pediatric subspecialty workforce. As predominantly academic physicians, pediatric subspecialists often play 3 essential roles: patient care, basic and clinical research, and teaching. Future workforce studies must address all 3 of these roles to assess the adequacy of this workforce. For patient care, future studies need to explore this issue from the demand side by using measures such as number of days until a new patient appointment is available and the distances patients travel to obtain care. Studies of claims data and application of geographic information systems may be useful in identifying areas of underservice. To evaluate the relationship between supply and pediatric subspecialists’ availability to perform academic research, queries of the CRISP (Computer Retrieval of Information on Scientific Projects) data system may be helpful in tracking trends in receipt of National Institutes of Health funding among pediatric researchers. Finally, assessments of exposure to pediatric subspecialists during medical school and graduate medical training, through surveys of students, residents, and/or program directors, may highlight underrepresented specialties and gaps in curriculum content. In the past several months, concerns have been expressed about the adequacy of the pediatric subspecialty workforce. To our knowledge, no systematic review of the pediatric subspecialty workforce literature has been performed. Our review shows that we know little about the size, distribution, and adequacy of the pediatric subspecialty workforce and that further studies are needed to determine if the size of this workforce is adequate to meet demand for patient care and meet the teaching and research requirements of these fields. Correspondence: Michelle L. Mayer, MPH, PhD, Department of Health Policy and Administration, The University of North Carolina at Chapel Hill, School of Public Health, Campus Box 7590, Chapel Hill, NC 27599-7590 (michelle_mayer@unc.edu). Accepted for Publication: July 2, 2004. Funding/Support: This study was supported by grant 1-K02-HS013309-01A1 from the Agency for Healthcare Research and Quality, Rockville, Md (the agency was not involved in the performance of the study). Acknowledgment: We thank Indu Adhikary, MSPH, for her assistance with the literature review, and Morris Weinberger, PhD, William Steinbach, MD, James Bader, DDS, and the Journal Club at the Cecil G. Sheps Center for Health Services Research for comments on an earlier draft of the article.